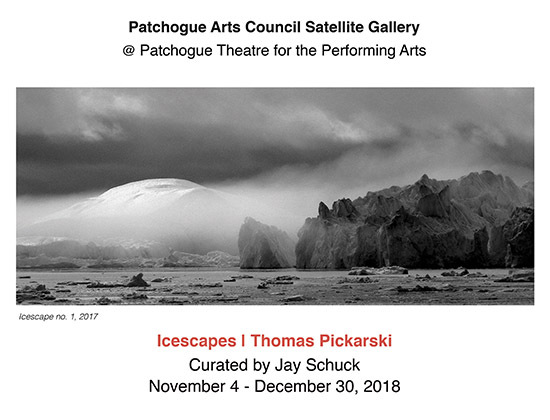 Exhibit: "Icescapes" by Thomas Pickarski | Patchogue Arts Council, Inc. The Patchogue Arts Council is proud to present Icescapes, a solo exhibition featuring the artwork of Thomas Pickarski. In this series of work, Pickarski captures the natural beauty of icebergs, as well as the otherworldliness of their natural landscapes. Each image accentuates the subjects’ natural form as well as their fragile state of existence. The exhibition is curated by Jay Schuck and is on view at the Patchogue Theatre for the Performing Arts from November 4 – December 30, 2018. The exhibition is open to the public during the theatre’s hours of operation. Thomas Pickarski is a fine artist from New York, NY. He received his BFA in Painting and MFA in Intermedia Art from Arizona State University (Tempe, AZ). His artwork has been exhibited nationally, with select exhibitions at Northville Art House (Northville, MI), the South Shore Art Center (Cohasset, MA), and Camerawork Gallery (Scranton, PA). He has published two books titled The End of Nowhere, Stories and Photographs (2014), and The Middle of Nowhere (2012). For more information on the artist, visit www.thomaspickarski.com. ABOUT THE PATCHOGUE ARTS COUNCIL – The Patchogue Arts Council, Inc., was formed to encourage, support, and promote the arts while aiding in the revitalization and sustainability of the community. The Patchogue Arts Council, Inc. is a 501(c)(3) non-profit organization whose focus is to serve the greater south shore of the Town of Brookhaven. The Patchogue Arts Council is located at 20 Terry St., Suite 116, Patchogue NY. For more information visit www.patchoguearts.org, call 631-627-8686, or email info@patchoguearts.org.